Before The Showdown: The Long Road To The Fiscal Cliff : It's All Politics References to the fiscal cliff, set for Jan. 1, have become ubiquitous in Washington. But many may have forgotten just how and when the looming tax increases and spending cuts were first devised. Senate Minority Leader Mitch McConnell, R-Ky., prepares to announce a debt ceiling deal in July 2011. 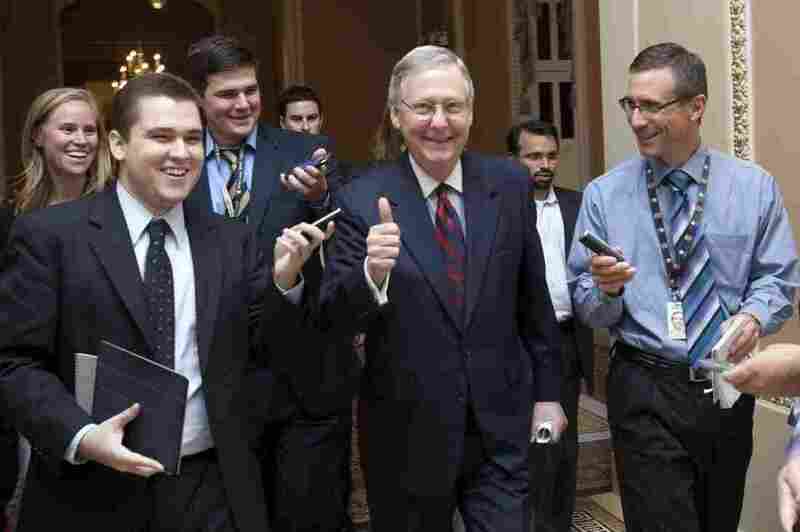 That deal laid the foundation for the across-the-board spending cuts set to take effect on New Year's Day, 2013. New Year's Day typically inspires hope and new beginnings. But this next one may be cause for trepidation. Tax cuts for all income levels expire on Jan. 1, 2013, and most federal programs will face a 10 percent haircut — because Congress failed to agree on a deficit-reduction plan. It all goes back to some hot, frantic days in late July and early August of 2011. Treasury officials were warning that the nation was near defaulting on its debt for the first time. Congressional Republicans, spurred by Tea Party activists, set off this unprecedented crisis because they refused to raise the government's borrowing limit unless spending was cut by an equal amount. And they would not accept more revenue as a means to offset a hike in the debt ceiling. More than $2 trillion in deficit reduction had to be found and fast. Congress hurriedly agreed to $1 trillion worth of cuts over the next decade, with the remainder to be found later by a congressional "supercommittee" proposed, at the time, by Senate Majority Leader Harry Reid. "There would be a joint committee that would move forward, and there would be a trigger that if they didn't resolve this, then something else would happen," Reid said in late July. "And based on past experiences, I think there would be tremendous incentive not to let that certain thing happen when the trigger kicked in." That "certain thing" Reid referred to is what's known as "sequestration." Lawmakers agreed that if they failed to come up with a deficit-reduction plan, draconian across-the-board cuts in federal spending would be triggered Jan. 1, 2013 — the same day that all the George W. Bush-era tax cuts were scheduled to expire. At the White House, President Obama gave his blessing. "If we need to put in place some kind of enforcement mechanism to hold us all accountable for making these reforms, I'll support that too, if it's done in a smart and balanced way," he said. Senate Minority Leader Mitch McConnell was also on board. "I think I can say with a high degree of confidence that there is now a framework to review that will ensure significant cuts in Washington spending," he said. Ross Baker, a congressional expert at Rutgers University, says that at the time, minds were not focused on what might be happening at the beginning of 2013. "It was August. August is a time for recesses, not the time for serious legislation," he says. "I think the real problem at the time was trying to ensure that there was not a default. They just had to get beyond that." Some Democrats, including Sen. Tom Udall of New Mexico, voted for the debt-ceiling deal only because it avoided default. "Almost everything else about this deal stinks, and it stinks to high heaven," Udall said at the time. And some Republicans voted for the deal, even though it could end up shearing a trillion dollars off defense spending. "This should never have been agreed to by members of Congress, but most of all, should never have been promoted by the president," said Arizona Sen. Jon Kyl. Ultimately, the supercommittee charged with finding additional deficit reduction last year failed to do so, after Republicans on the panel rejected raising any new revenue. So the trigger for automatic spending cuts was cocked. But in his final debate with then-presidential candidate Mitt Romney, Obama seemed to rule out sequestration. "First of all, the sequester's not something that I proposed," he said. "It's something that Congress has proposed; it will not happen." Baker thinks the president had reason to trust that Congress would prevent sequestration. "With a gun at its head, Congress will, in fact, act," Baker says. "But then, and only then." Indeed, after meeting with Obama last week, Sen. McConnell and House Speaker John Boehner said there could be a new way to cut deficits. Both said they are prepared to "put revenue on the table." And if lawmakers do hit on a way to mix spending cuts and more revenue to cut deficits and avoid sequestration, New Year's could be cause for celebration.